You might not be aware unless you’re up on the latest gaming hardware, but Microsoft is trying to kill the Kinect. While the Xbox One famously included it as a mandatory pack-in accessory at launch (this was later abandoned to get the cost down), the latest versions of the system don’t even have the proprietary port to plug it in. For a while Microsoft was offering an adapter that would let you plug it into one of the console’s USB ports, but now even that has been discontinued. Owners of the latest Xbox One consoles who still want to use the Kinect are left to find an adapter on eBay, where the prices have naturally skyrocketed. 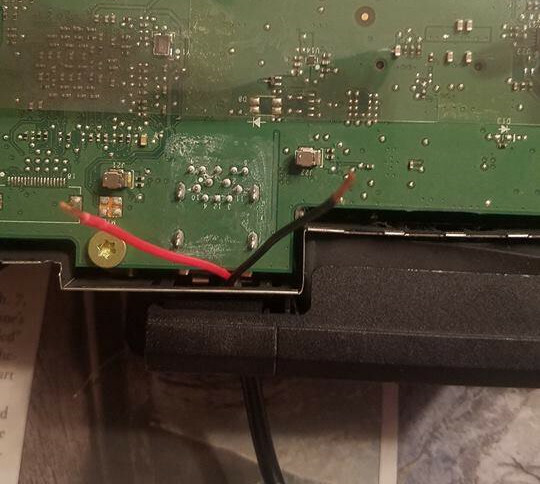 Recently [Eagle115] decided to open up his Kinect and see if he couldn’t figure out a way to hook it up to his new Xbox One. The port on the Kinect is a USB 3.0 B female, but it requires 12V to operate. The official Kinect adapter took the form of a separate AC adapter and a “tap” that provided the Kinect with 12V over USB, so he reasoned he could pop open the device and provide power directly to the pads on the PCB. [Eagle115] bought a 12V wall adapter and a USB 3.0 B cable and got to work. Once the Kinect was popped open, he found that he needed to supply power on pin 10 (which is helpfully labeled on the PCB). There’s just enough room to snake the cable from the AC adapter through the same hole in the case where the the USB cable connects. With the Kinect getting 12V from the AC adapter, the Xbox has no problem detecting it as if you were using the official adapter. At least for now, they haven’t removed support for the Kinect in the Xbox’s operating system. The Kinect has always been extremely popular with hackers (it even has its own category here on Hackaday), so it’s definitely sad to see that Microsoft is walking away from the product. The community will no doubt continue pulling off awesome hacks with it; but it’s looking increasingly likely we won’t be getting a next generation Kinect. Nespresso is a variant of disposable single serve coffee pods with an extensive, expensive, and proprietary accessory line. After selling inconvenient bits of his soul for convenience and, admittedly, fairly tasty shots of coffee, [Chriss Lott] was predictably betrayed by his Nespresso Jura coffee machine. Rather than simply exchange more local currency for a replacement revenue guarantee for the Nestle conglomerate, he did what any self-respecting hacker would do and tried to fix it himself. Unfortunately he quickly found their cunningly oval shaped security screws to be more trouble than his time was worth. He listed his remaining coffee pods for free on craigslist and decided to toss the machine in the planned obsolescence receptacle which comes standard in any civilized home. This is where our story would end were it not for the kindness of a fellow hacker. [Dave H] was browsing through craigslist when he spotted the sad tale. However, possessing a different skillset from [Chris], [Dave] had solved the particular oval shaped conundrum with a security screwdriver hand made from an old bolt. He answered his fellow hacker’s vaguely ardent plea and mailed the converted bolt over to [Chris]’s house. With the proper tool in hand, [Chris] quickly discovered that all that was standing between him and his convenient coffee was a bit of schmoo between the cost cutting membrane switch and its mating pad on the circuit board. With the practically free repair complete, the machine happily vibrated back to life and produced coffee as if its planned obsolescence wasn’t for another few years. We assume a Nestle engineer was thrown into the pit on principle for this loss (they, of course, are evil enough to have a pit). We’re not sure how the story proliferated through the internet, but we do know that it was inspirational to many convenient caffeine deprived hackers with similar problems. [Chris] found himself the hub in a network of circumnavigating security screw circumventing hackers. [Dave]’s hacked bolt was the first to go on an adventure resulting in the repair of many machines before the postmen lost it under a cart, standard procedure. A replacement was purchased from an eBay seller for a hefty $40 american dollars and took up the journey where it left off. Others sent in guides on making the tool for those unwilling to wait for one to be shipped. In fact, even the maker of the $40 dollar tool weighed in on the issue. Apparently he was unaware that the consumer and commercial Nespresso machines used the same tools. A hacker himself, he ran a listing of the custom tool at a quarter of the price for the home repairman and another for the commercial appliance at the higher price. The whole page is an entertaining read, for a certain kind of person, about appliance repair, reverse engineering, and camaraderie. Happily, the hub is still alive. If you find yourself with an oval screw which needs turning, get in touch with [Chris] and a strange community’s kindness will have a nomadic security bit crossing nations your way soon. Legend has it that Henry Ford would send engineers out to junkyards all over the US looking for Fords. They were supposed to study each one they found and make note of any parts that had not failed. But it wasn’t so that he could start making all of those parts stronger. Instead, Ford allegedly used this data to determine where he could cut corners in future production runs so as not to waste money by making any part last longer than any other part. Most things tend to break down rather than completely giving out. Usually it’s only one or two components that stop working and the rest of it is still serviceable. And this is a good thing. It’s what lets us repair PCBs or scavenge parts off them, drive our cars longer, and help save each other’s lives through organ donor programs. Can you imagine how different life would be if each part of every thing failed at the same time? Poor [makendo] had seven broken bread makers lying around, all with failed paddle drivers. Since they also all have big motors and other useful parts in them, he decided to turn one of them into a powered tool-sharpening turntable. First, [makendo] salvaged the motor, the gear, and the thick circular glass window from one of the bread makers. He cut a platter from plywood the size of the glass window, chamfering the edge to fit the gear. Next, he built a housing from scrap plywood, separating the motor from the platter with a crosspiece to keep the motor free from dust. A large magnet on a hinge collects metal powder from the system quite effectively. The sharpener spins at about 200RPM: fast enough to do the job and slow enough not to get hot. According to [makendo], the sharpener restores bevels nicely but doesn’t make edges”scary sharp”. To that end, he used a toaster oven door as a base for a series of micro-abrasive grits of sandpaper as a finishing rig. In order to sharpen his chisels uniformly, he made a jig to hold them firmly in place against either the powered turntable or the fine sandpapers.